Ciwt has four more episodes of Season Two left in her Ray Donovan binge, so she still has a mind for crime. Or, in the case of The Death of Marat, murder. The painting (or its image) is well-known and respected in art circles and beyond for many reasons: its size , the quality of the brushwork in the softly painted but indeterminate background. In contrast the foreground with its striking, horrendous and historically accurate details is deeply dramatic. The details are all there, painted sparely, rationally. 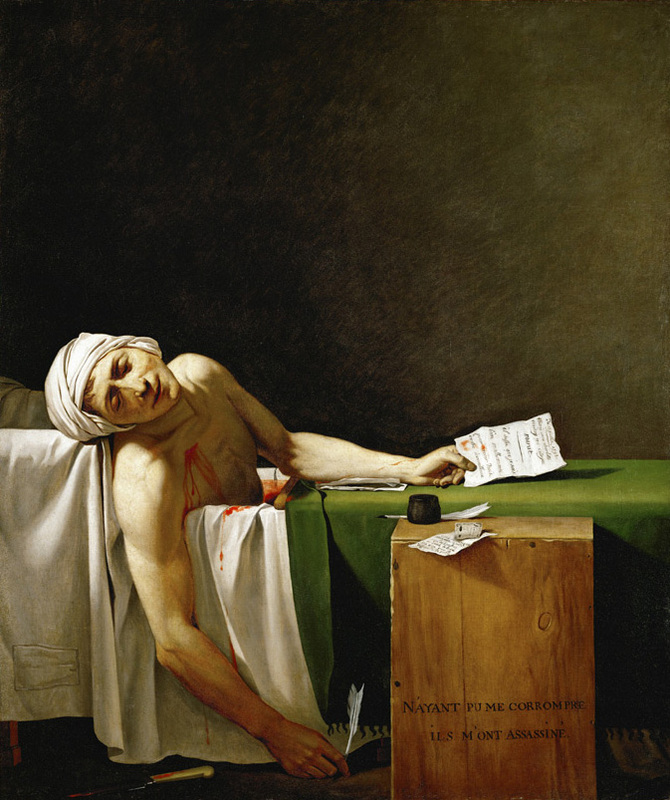 Painted exceedingly rationally, we see Marat in his tub, the wounds, the blood, the fatal knife, the letter sent by Charlotte Corday which gained her entry in order to murder him. The tragedy of the death of this important leader of the French Revolution is made even more poignant by the simple spareness of his homely furnishings and body language that likens him to Michelangelo's Jesus in Pieta . David clearly makes of Marat a secular martyr at the highest level. Much more could be said of Death of Marat's technical triumphs; it is a truly great painting by a highly talented artist. But what interests Ciwt today is its political aspects; Death..is first and foremost an image of propaganda promoting the democratic, secular and rational ideals of the Jacobean revolutionaries. David was a major force in this most zealous and violent overthrowing party. He came to act as its minister of propaganda and was commissioned by the new French Republic to commemorate Marat as a hero of the people's revolution. As painted it is instantly obvious that Marat was a good, innocent, noble victim of a duplicitous, scheming woman. By extension noble too was all that Marat stood for: the New Republic, publishing, moving power into the rational hands of the democracy and away from the brutal and heedless aristocracy as well as the superstitious Church. Clearly David, the artist, shows himself in this painting to be deeply engaged in the principles and ideals of the Revolutionary party. But was he? This is the question that interests some art historians and Ciwt. It arises because nearly as soon as the New Republic failed and Napoleon became Emperor of France, David became Napoleon's court painter. That is, within a matter of a couple of years, David went from being essentially Minister of Propaganda for the Revolutionaries to having that exact same position within Napoleon's Empire. This is a truly shocking reversal and causes many to question whether David was at heart an artistic and political mercenary aligning himself with whoever was in control at the moment. Ciwt thinks it is more probable that David was a survivor, and siding with Napoleon was the only way to ensure his life.